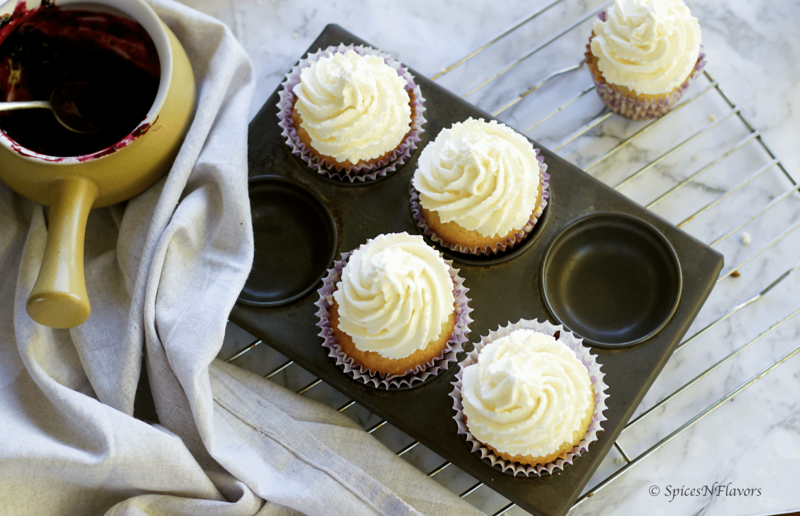 Vanilla Cupcakes are an all time favourite at my place. One that it is portion controllable and two that this recipe is so friendly that you can easily halve or double it. So I always make a small batch of cupcakes which makes my life easy. Today I made 12 cupcakes just to see how it works in the cooker and the oven. However when I had made these cupcakes for my daughter’s birthday party – The Little Krishna Theme party I had made a double batch with both vanilla and chocolate cup cake recipe. What is so much fuss about baking?? Why don’t you get the perfect cupcakes each time? Why do your cupcakes sink at the centre?? People say baking is a science and not everyone can do it. But I feel just like cooking baking is an art too.. If you know what you are doing and the logic behind it then you can never ever go wrong and will get everything right everytime you do. If you love baking and want to start it then I would recommend you to try out my Rava Cake which is eggless, no maida, no oil and no butter. So it is kind of a perfect cake for beginners. And when you gain confidence you must definitely check out my Baking for Beginners series and specifically Chocolate chip cookies or Chocolate Muffins. Now that you are all in to baking do try my Chocolate Yogurt Mousse tart. You will just love it. On my last checkerboard cookies post; one of my friend shared with me that her pressure cooker kind of burned at the base and sides and got marks. Now that is one disadvantage when you try baking in cooker. But there are two things that I noted personally. This time I used table salt instead of rock salt which I think did not turn black unlike last time. Two I found that my stand that I used last time was rusted which as per me was one of the reason which added to the blackening. So this time I used my colander which helped a bit. Have you tried baking in cooker? Do you face the same issues? Do you have a remedy for it? Comment below and let me know. 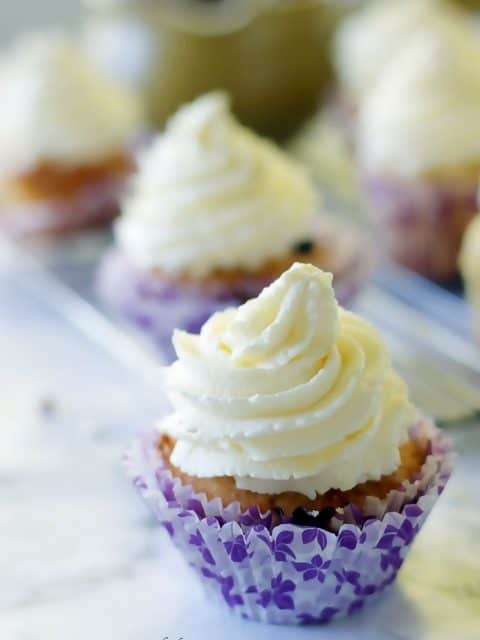 No doubt the products turned out good but you know comment below and let me know..
Well the cupcakes were super light as we had creamed it really well. I happen to love plain whipped cream frosting. Its so simple and moist. However you can use any frosting on top with any flavour. 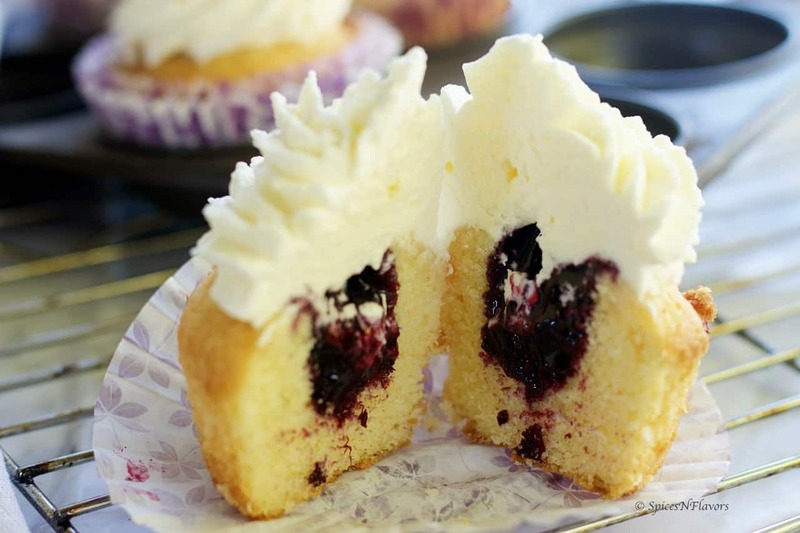 The blueberry filling in inside made the cupcakes super moist and increased the flavour quotient. In fact it was kind of a surprise for my husband. He was amazed by it as he thought its a normal vanilla cupcake but to find some blueberry inside he felt really happy. If you like this recipe then do tag me, tweet me or instagram me. I would love to hear from you. Whisk together eggs and vanilla and warm to approx. 23°C. Add egg to batter in 4-5 stages with the last stage being added slowly. Scrap bowl throughout every stage. Bake in a preheated oven at 180°C for 15 mins or in a pre-heated pressure cooker for 20-22 mins. 1. You absolutely can skip making the blueberry jam or filling in here but it adds a different flavour and moistness. You can use any other berries instead. 2. 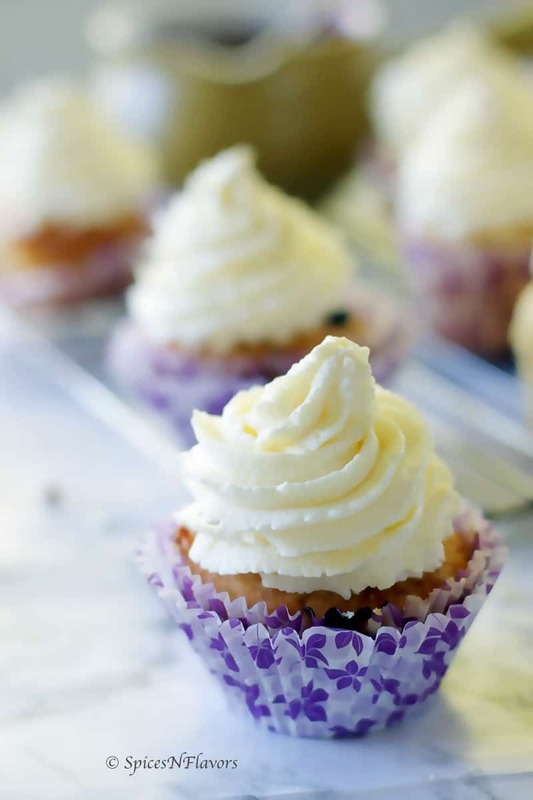 Instead of whipped cream you can also go for cream cheese or italian meringue frosting. I have used plain whipped cream here you can go for vanilla or even add a tsp of the jam to it, mix and frost. 3. 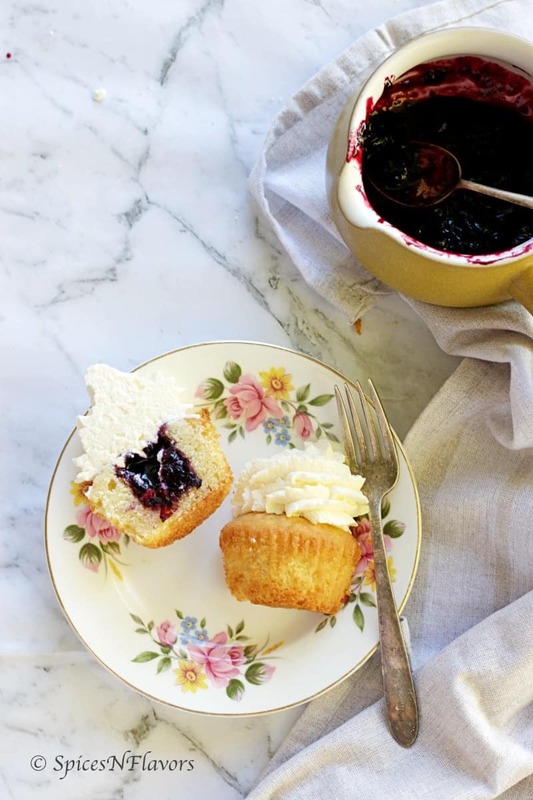 Instead of making your own jam you can even choose to add store bought jam that you use regularly at your home. 4. In order to avoid curdling of the eggs, add a tbsp of flour along with the last addition of eggs into the creamed butter and sugar. By the way its Rakshabandhan tomorrow and if you are still wondering what to make check out my 23 Indian sweets recipe that can be made in or under 30 minutes. 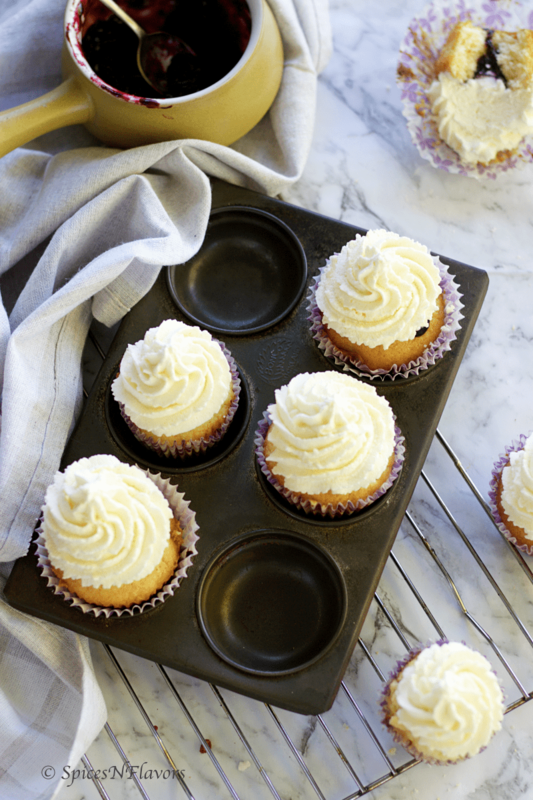 Wow, your vanilla cupcakes look so so yummy! And blueberry filling is and excellent addition. Thanks sweetie.. Indeed the blueberry filling was so yum!! Everytime I see this post, I feel like grabbing one of them 😍😍perfectly frosted too!! Yum! Looks so moist and delicious. The icing looks perfect! That is really so sweet of you.. Thank you for those kind words..
How gorgeous looking these cupcakes are! So moist and yummy!